work great for me! Ty for the tips! Very useful guide. Keep up the good work ! I have replaced the hard drive on my Mac Mini mid-2011 with a Vertex 3 SSD, and to my surprise I did not have to mess with the logic board (step 13 onwards) to slide-in the new drive. So it took me less than 20 minutes to do the whole thing. After that, recovering the whole system from Time Machine was a breeze. I should have read the comments first. I thought it should be possible to take out the drive without removing the whole board. What would be the process to install the OS if you don't have an external DVD drive? Is there a way to clone the current HD into the new SSD with a USB -> SATA adapter? The only hard part was reconnecting the antenna. It is a small connection in a fairly tight space. So, if you can avoid disconnecting it, I would recommend it. As others have said, it is possible to remove the HDD without moving the logic board. And the antenna board can also just be rotated out of the way. However, I found it impossible to reseat the new drive (a Crucial m4 SSD) into the correct location without moving the logic board out a little anyway. I just couldn't get the bumper screws lined up in the top slot. This is on a mini i5 with a single HD (now SSD). In the end I got it done, but this step was much more difficult than I expected. Perhaps it is easier when there are dual drives? I also initially caused the SSD connector to disconnect from the logic board when tightening the Antenna screws back up (step 8). So take care and do this slowly and check everything is aligned! I had a difficult time lining up the two holes as well due to gravity. So I took a piece of tape, secured it to the top (bottom) of the drive near the case, and pulled on the tape to lift the drive into place and into the two drive holes. Worked great and I had less pieces to remove and reconnect. Do i need T8 with security bit or the simple T8 will work ? Thank you, you are right! Did it the same way and it worked quite well. Be very careful with that IR connector, it will tear right off the board. Hold down the outside while prying out the inner part. Also, make note of where the rubber grommets are as you remove the fan, so you can replace them. The instructions do not make note of them. I've managed to complete the steps successfully. I have plugged in my MacMini for the first time the the green power light is not turning on. Can anyone assist? Just replaced the disk in my 2011 MacMini and I want to recommend, like others already have, to READ THE COMMENTS before starting the job! You save a TON of time, it took me way less than expected. You don't need to unplug any cable or remove the motherboard, etc. Also, great tip about reinserting the antenna plate using a pape clip, that was the most difficult part! Does it accommodate 15mm high drives or only the 7 or 9.5 mm drives? I just did this to my mid-2011 Mac Mini - I'm very novice at this kind of thing, so I just wanted to say 'thanks' to original poster and the helpful comments. It's true, you do not need to remove the mother board and can skip all those steps. And you don't need to disconnect the antenna connector (step 10) - just put it off to the side. 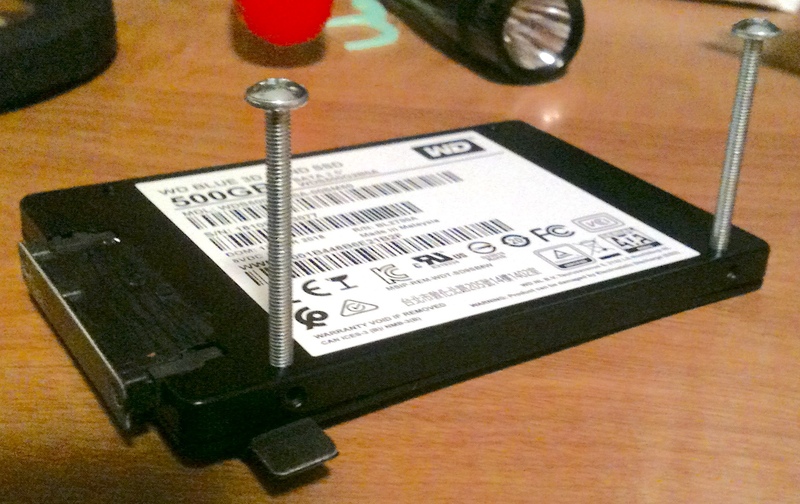 I put in a Samsung 850 EVO SSD drive and it was quite thinner than the original - so very easy to stuff in there. Also: there's no need to worry if you have a wireless bluetooth keyboard. Even with a totally new, blank, unformatted SSD, the Mini will still recognize and work with your keyboard. I created a 'usb installer' of Sierra, held down OPTION on first boot and it worked like a charm (it will prompt you to format the drive first - but it's very easy!). Overall, it was WAY EASIER than I thought it would be! And worth it - programs launch much quicker now. If you have trouble getting the hard drive in place, create a sling using a long slice of paper. This helps you lift the far end into place. Once connected you can pull the paper through. No gravity needed, no need to remove the board this way. Instructions were great, skipped the logic board removal, etc. and everything was fine. Most difficulty I had was getting the lugs on the fan back over the rubber bumpers on re-assembly (they’re old and kinda trashed). Replacing the spinney drive with an SSD was much easier than expected. Didn’t use the special logic board removal tool, but it was cheap enough that I was just glad to have it. 20 minutes? No, more like an hour for the first go, but I have another one that needs an SSD so I’ll get a chance to better my time. Much thanks for a well-done set of instructions, although the previous writer who mentioned reading ALL the notes first gets a +1. Another case of RTFM, right? Anyone had issues with their original hard drive feeling glued down?! My hard drive won’t budge at all. Thomas in SBME - took 3 hrs but it worked at boot up (i had already cloned the drive from original). Biggest issue was getting the Wifi screen back in the slot (read the comments under step 9. a BIG THANK YOU. I now have a 2011 Super minimal with 16 GB ram and a 480 SSD!!! !